Oval face: this is a neutral face shape and can use any frame model. Heart or triangle face: rectangular frame, pilot model (aviator, see below) and cat eyes frame, are match with this face shape. Square face: oval or rounded frame, cat eyes frame (see below), or frame with curved corner can be choosen. Round face: choose glasses with rectangular frame or square that have sharp corners. Frame made of metal has an adjustable nose bridge. While plastic frame has non adjustable nose bridge. For people who have a small flat nose should not use wide lenses spectacle as it will cause the nose look smaller and flatter. Cat eyes spectacle with wide lenses causes the nose appear smaller, but the wide round-lenses (has no sharp pointed corner) spectacle has less effect to nose. If you have long or big and pointy nose, big cat eyes spectacle will fit for you. Read also how to choose wristwatches. 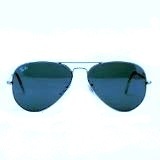 Pilot sunglasses (aviator sunglasses, as below photo) is characterized by curve oval frame shaped like egg, dark lenses sometimes using reflective of mirror lenses, often have wide lenses two or three times the size of the eyeball, and a very thin metal frame with two or three bridges and bayonet type ear hook with flexible wire. Lenses color are usually neutral gray, transmitting 20% of incoming light. Large lenses are not flat but slightly convex. Design can cover the entire area of ​​the human eye and prevent as much light directly into the eye from any angle. Tan or brown skin, will suit perfectly with the cream-colored or brown frame. Bright skin color, white or yellow, this is neutral color and fit with all frame colors. Dark skin, you should choose soothing colors such as blue or red or maroon metallic color. Yellow or pink skin (like Caucasians) will match with frame with color: brown, yellow and green. Black frame or dark gray is usually suitable for all skin tones. In order to get the right lens, first you should have to know the function of the glasses. You should see the doctor for knowing your eye problems, for example minus (near-sighted eyes, myopia), plus (far-sighted eyes, hyperopia), or cylindrical (astigmatism). Another function of glasses is to protect eyes form sun ray. Choose glasses with dark lenses or sunglasses and coated with UV Protection Coat. If you frequently use a computer, choose glasses that contain anti-radiation of computer. For those who often do outdoor activities and exposed to sunlight, you should always use sunglasses as it has a lot of benefits, namely: to prevent cataracts and eye cancer. Trigger the onset of cataract is ultraviolet radiation. By using sunglasses with ultraviolet blocking lenses, the eyes will be protected so that the cataracts can be prevented. Sunglasses also prevent dangerous diseases such as eye cancer (melanoma) and eyelid cancer (carcinoma). Using cheap sunglasses without ultraviolet filtering lenses is more dangerous than without using that cheap sunglasses. Because your pupils are wide opened by low intensity light filtered by cheap sunglasses, but that sunglasses will not filter ultraviolet light. That cheap dark lenses will allow more ultraviolet light comes into your wide opened pupils. As it has no color, it is not easy to check ultraviolet lenses. When you're choosing sunglasses, look for UV-protection details on product labels. Choose sunglasses that block 99 to 100 percent of both ultraviolet A and B (UVA and UVB rays). So if you have near-sighted eyes, and have to use glasses for outdoor activities, it is better if you use darkened lenses (tinted lenses) with ultraviolet blocking. If you have far-sighted eyes and using progressive lenses (two focuses), then the top part of your lenses can be darkened plus ultraviolet blocking. Lenses color are usually matched with the color frame, grey or black frame has grey tinted glasses, brown frame match with brown tinted glasses. Lens color is usually matched with frame color. Black frame matches with gray lens. Brown frame maatches with brown lens. But the black frame usually can be matched with a variety of lens colors. Ultraviolet lens does not have color alias clear. This lens has a material that does not pass (blocking) ultraviolet light but pass others that visible to the eye, making it appear to the human eye as transparent lens. Using a hat with an anti-glare cap also helps prevent ultraviolet light entering from above through the gap between the lens and forehead. Some glasses are designed to be wrap around forehead to prevent ultraviolet rays coming through the gap. Gray lens is the most popular, sometimes called black or dark lens. This lens reduces light intensity and no color change. Suitable for sunny weather and light sensitive eyes. Suitable for driving the vehicle, cycling, sea fishing, and others. Brown lens will increase the contrast, visibility and depth perception. Suitable for sunny weather. This lens filters blue color. Good for driving, cycling, shallow water, golf. Yellow lens can transfer light better, making distant objects appear more clearly. Increase the contrast to see more clearly, and filter out most blue light. Suitable for use when the weather is foggy and cloudy. Popular for driving at night, pilot, cycling and shooting sports. Amber lens, this color is between yellow and orange and popular now. Usually used by driver, cyclist, boater, pilot. Orange lens increases contrast and filter blue light. This lens is suitable for use when the weather is overcast or cloudy. This is the most common color of spectacle lens used for clay target shooting. Also used for driving, pilot, cycling and skiing. All lenses that do not pass the blue color, like brown lens, yellow, amber and orange, will make distant objects appear more clearly making it suitable for driving, cycling, skiing, sailing, and flying. But specifically for driving and cycling, the lens should still be able to see the difference of traffic sign colors and colors of traffic light clearly. Red lens is brightly colored improves contrast so see more clearly. Often used for fishing in the early morning or evening. Suitable for shooting in sunny weather. Also be used for skiing and hunting. Blue lens passes blue ray and block others. Suitable partly cloudy days and sunny weather. Good for driving in the snow, tennis and golf. Used mostly as cosmetic. Purple (violet) enhances the contrast and reduce certain background. Violet is often used for sport shooting with average conditions or sunny. Also be used for skiing, driving in snow and golf. Used mostly as cosmetic. Green lenses (green) has a slightly better contrast than the gray, but it is not considered a high contrast lens. Green color balance and is a good choice for a variety of light conditions. Used for driving, tennis and golf. Used mostly as cosmetic. Polarized lenses reduce glare from reflected light, such as sunlight reflected by snow, water, beach sand, road pavement. Suitable for driving, sailing and fishing, skiing. But polarized lenses may also react with the tints in windshield, creating blind spots and diminishing the visibility of LCD readouts. Photochromic lenses will be darker to reduce the intensity of light when sunny day, but it takes time to adjust (to be darker or lighter) as light changes. Photochromic lenses do not work well in warm conditions, it will become darker if the weather is cooler and brighter if the weather is hot. This lens will darken when exposed to ultraviolet light. This lens does not work while in the car because the car glass block ultraviolet light. Polycarbonate lenses provide impact protection in dangerous activities or sports. Mirror-coated lenses reduce the intensity of visible light to avoid glare, but does not necessarily reduce the intensity of ultraviolet. Gradient lenses. Single gradient lens, which is dark on top and light on the bottom, reduce glare when viewing distant objects. Single gradient lenses suitable for driving, because no glare when viewing distant, and not too dark when viewing instruments on the dashboard. Double gradient lenses are dark on the top and bottom, but the lighter in the middle. ouble gradient lenses suitable for water sports or winter sports, where there is the reflection of light from the bottom, but not suitable for driving as you need to see dashboard clearly. Astigmatism is a disorder of the eye that is caused by the uneven curve of cornea is uneven. Astigmatism can be happened to various social status, age and gender. Eyeball in the normal state is shaped like a ball so that the incoming light or shadow can focus at one point on the retina (the light sensitive area of ​​the eye). In patients with astigmatism, eye is oval-shaped like an egg. The light or shadow in the eye is spread or does not focus at one point on the retina. So the shadow will look blurry and only visible at a certain point only. Shadow which somewhat distant from retina focal point retina will seem blurred and bumpy. In astigmatism eye, shadow can only be focused in horizontal so the top and bottom edges are blur, or just focus only vertically so that the left and right are blurred, as shown below is a sample picture from wikipedia. Almost all degrees of astigmatism can be corrected with glasses or contact lenses. In patients with mild degrees of astigmatism do not require correction at all, as long as it is not accompanied by nearsightedness or farsightedness. Glasses for astigmatism are using cylindrical lenses or toric lenses. Astigmatism can also be corrected by using a laser surgery to repair cornea curve. Shades is probably the most widely used term for sunglasses in North America. Glares is a term popular in India if the glass is dark. Glints is a term for glasses originating from the "glint" that is noticeable when somebody wearing glasses moves their head. 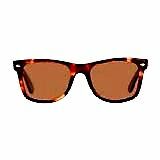 Sun specs (also sunspecs) is the shortened form of sun spectacles. Dark glasses (also preceded by pair of) — generic term in common usage. Solar shields Usually refers to models of sunglasses with large lenses. Stunna shades Used as a slang term in the hyphy movement, usually referring to sunglasses with oversized lenses. Cooling glasses is a term used in Southern India (predominantly Kerala) and the Middle East for sunglasses.